Author Sarah Loudin Thomas has found her niche with her lovely and endearing stories. Her covers are always inviting and I am always drawn into her novels in the first few paragraphs. She has a way of creating characters that are lovable and have real struggles. I loved that Thomas picked up the story line from her debut novel, Miracle in a Dry Season. While I was a little shaken by a shocking event in the first pages, I was happy to see old friends in this new novel. (Dying to tell you, but no spoilers!) Having said that, you can pick up with this title without having read the first. In Until the Harvest, we meet Henry Phillips who is the son of Casewell and Perla Phillips from Miracle in a Dry Season. Henry is wanting to quit college and find happiness with his fiddle and wherever that might lead him. An unexpected tragedy followed by an unlikely friendship change his life forever. 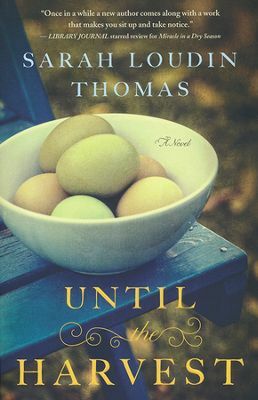 Thomas did not disappoint with Until the Harvest, she writes a guaranteed good read and I am so glad I didn’t miss this one! I enjoyed the subtle and growing relationship between Henry and Margaret. I am anxious to see if their story is continued in her next title. I was given a complimentary copy of this book by its publisher in exchange for an honest review (I would have purchased this book anyway! Sarah Loudin Thomas is on my list of favorites) All opinions are my own and I have not been compensated.